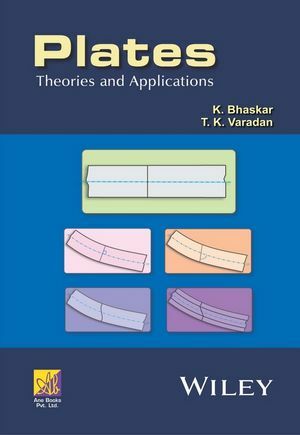 Plates: Theories and Applications provides a comprehensive introduction to plate structures, covering classical theory and applications. It considers plate structures in several forms, starting from the simple uniform, thin, homogeneous metallic structure to more efficient and durable alternatives involving features such as variable-thickness, lamination, sandwich construction, fiber reinforcement, functional gradation, and moderately-thick to very-thick geometry. Different theoretical models are then discussed for analysis and design purposes starting from the classical thin plate theory to alternatives obtained by incorporation of appropriate complicating effects or by using fundamentally different assumptions. Plates: Theories and Applications alsocovers the latest developments on the topic. Professor K. Bhaskar is the Head of the Department of Aerospace Engineering at the Indian Institute of Technology, Madras. As part of the Structures Group, he teaches courses related to Solid Mechanics and Elasticity. His main research interest is theoretical modeling of thick laminated structures. T. K. Varadan worked in the Department of Aerospace Engineering at the Indian Institute of Technology, Madras for more than thirty-five years before retiring in 2001. Besides teaching a wide variety of courses related to Structural Mechanics and Aircraft Design, he has made significant research contributions in the areas of Non-linear Vibrations and Composite Structures, with more than one hundred refereed publications in international and national journals.